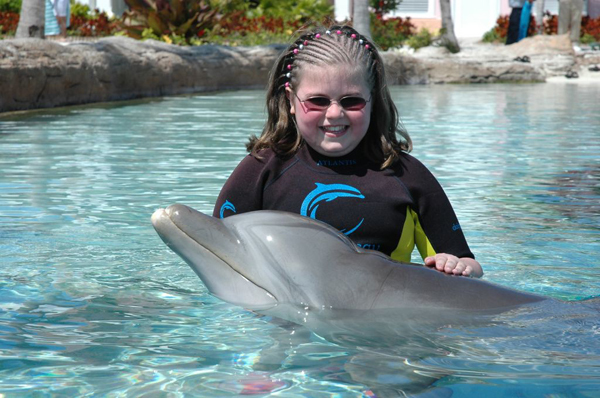 Thirteen year old Meghan Griffin and her mother Paula were interviewed by The Bahamas Weekly during their stay at Atlantis the week of March 1st, 2009. Photo courtesy of Dolphin Cay, Atlantis, Paradise Island. Paradise Island/Grand Bahama Island, The Bahamas - The Bahamas Weekly News Team brings you a heart warming and heart tugging interview with thirteen year old Meghan Griffin, who is presently visiting in The Bahamas and is staying at Atlantis on Paradise Island with her family. Meghan is a recipient of the Make-A-Wish Foundation, an organization that grants wishes and offers hope, strength and joy to children with life-threatening medical conditions. Meghan's wish was to visit Atlantis in The Bahamas, and through our contacts we learned of Meghan and set up an audio interview via phone. You will hear first from Meghan's mother, Paula Griffin who provides information on Meghan's illness and shares the daily struggles she and the Griffin family go through in order to keep Meghan alive. Mrs. Griffin also offers words of encouragement to other families who may be facing terminal illness. The Bahamas Ministry of Tourism also heard of Meghan's visit and the Griffin family were greeted by a Tourism host at the aiport who provided them with special pre-clearance and shuttled them swiftly through to their awaiting limousine ride to Atlantis. Atlantis offered the family a magical environment for their once in a life experience and helped make Meghan's stay even brighter with a dolphin encounter at Dolphin Cay. (AUDIO) Remembering the legendary Micheal Lucien Curry‏ of "Cooling Waters"